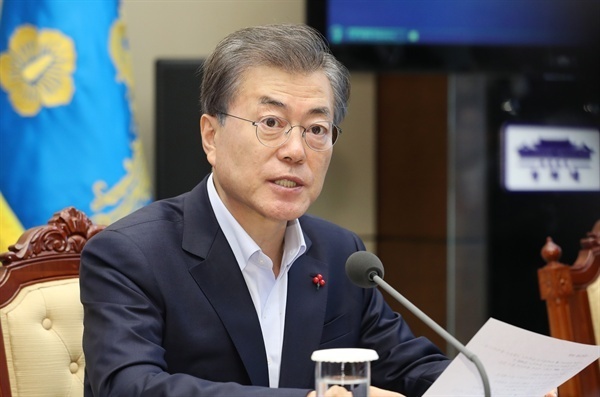 President Moon Jae-in's approval rating fell last week to the lowest point since he took office in May last year, amid an economic slowdown and a stall in progress toward North Korea's denuclearization, a poll showed Monday. Moon's support level came to 48.4 percent last week, down 3.6 percentage points from the previous week, according to a weekly poll conducted by Realmeter on 2,513 adults across the country. Moon's approval rating has declined for nine straight weeks since hitting 65.3 percent in late September following his third summit with North Korean leader Kim Jong-un in Pyongyang. "The decline is mainly attributable to economic difficulties and stalled denuclearization talks (between the United States and North Korea)," the pollster said. The public support rating for the ruling Democratic Party fell 1.2 percentage points on-week to 38 percent, it showed. It also marked the ninth consecutive weekly fall and the lowest rating in nearly two years. But the rating for the main opposition Liberty Korea Party rose for the fifth straight week to 26.4 percent. It was the first time in two years that the party's support rate has risen above the 25 percent mark.